When the Windsor Spitfires drafted Gabriel Vilardi and Michael DiPietro during the 2015 OHL Draft, it wasn’t a matter of if they would be NHL prospects but when. This weekend, the two got that answer. 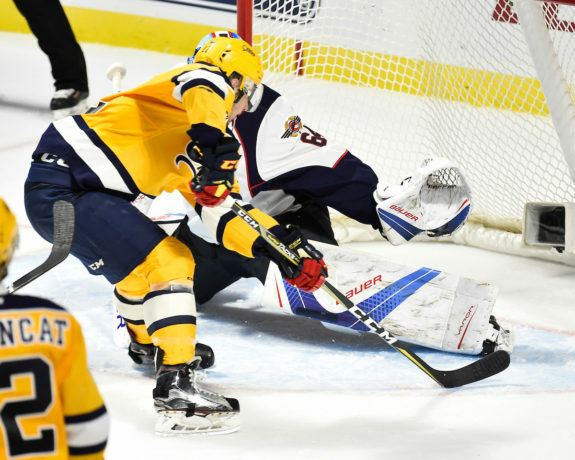 All season, both Vilardi and DiPietro had been rated high in the NHL prospect rankings for the 2017 NHL Draft, which took place in Chicago over the weekend. Vilardi finished fourth among North American skaters while DiPietro was fourth among North American goaltenders. This was the moment they were waiting for and it didn’t last long. Vilardi was selected on Friday evening, taken in the 11th overall by the Los Angeles Kings. DiPietro came shortly after on Saturday morning, selected 64th overall (third round) by the Vancouver Canucks. For Windsor and their fans, these two selections come as no surprise. 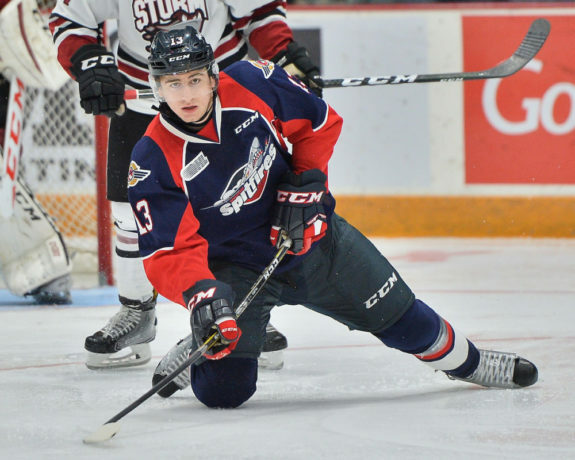 When the Spitfires drafted Vilardi in the first round in 2015, he came advertised as a big center with pro potential. He lived up to that billing right away, dominating the offensive zone with his work ethic. It became well known that if Vilardi was on the ice, the Spitfires had a chance to put one home. In his rookie season in 2015-16, he put up 38 points in 62 games. As impressive as those numbers are, they increased significantly in 2016-17 to 61 points in 49 games. Injuries kept him out for much of the first half, preventing what may have been a magical season. Vilardi joins a Kings organization that features former OHL players like Jeff Carter, Tyler Toffoli and Drew Doughty. For DiPietro, the Spitfires couldn’t select him fast enough when the second round of the 2015 OHL Draft got underway. The Amherstburg native came with high praise from the local hockey circles and has lived up to the hype. While the Spitfires tried to bring him along slowly, he would have none of it. His .912 save percentage and goals-against-average of 2.45 in 2015-16 were impossible to ignore. DiPietro won the starters role after the January trade deadline and hasn’t looked back. In 2016-17, DiPietro tossed all draft pressure aside with a .917 save percentage and 2.35 GAA. He also had a team-record six shutouts and was masterful during the team’s win in the 2017 Memorial Cup. Vancouver is no stranger to the Spitfires either, as graduating defenceman and co-captain Jalen Chatfield signed with the Canucks in March. While the old cliché is “anything can happen”, it’s unlikely that either Vilardi or DiPietro makes the NHL this season. Vilardi is only 17 years old (turning 18 in August) while DiPietro just turned 18 earlier in June. They could get a good look during pro training camps and pre-season, but there’s little doubt both will be back in Windsor before long. The 2017-18 OHL season could be an ideal time for both players. With the Spitfires rebuilding, Vilardi can now take control of the team as a leader, both in the room and on the ice. His offence will be needed and, after missing a good portion of last season, a healthy campaign would do wonders. The same can be said for DiPietro. His play in the Memorial Cup was nothing short of remarkable and he can use the 2017-18 season as a teaching tool with the younger roster. Windsor is likely to give rookie goaltender Brock Baier a long look in camp. Who better to learn from than DiPietro? Spitfires fans will want to enjoy the 2017-18 season, though. These two talents won’t be in the OHL much longer. Vilardi and DiPietro are destined for the spotlight. Windsor fans have enjoyed their success since that Saturday afternoon in April 2015. Soon, the Canucks and Kings will enjoy it, too.